Have you have been looking at that strange sword grandpa brought back from japan after Second World War, and wondering it is worth anything? It might be worth $300 or $30,000. Japanese swords are some of the most highly sought after artifacts from the Far East. Determining the worth of a Japanese sword takes skill and experience in looking at the features of the sword. A sword’s worth will be dictated by its age, history, and the sword smith History. The technology of the Japanese sword was perfected long by master smiths as early as the 10th century AD. Even modern sword smiths find it hard to replicate some of the more exquisite swords from those early times. Japanese swords differ slightly in make depending on the era they were made in and the fighting needs of the time. • Modern swords – swords made by living wordsmiths. These can be replicas of any of the older swords with custom designs by the buyer. There are several types of Japanese swords with different fighting needs. • Katana – sword with length up to 60.6 cm. • Wakizashi – shorter sword worn indoors. Length of typically 30-40 cm. Prices for authentic handmade Japanese swords start at $3,000. There are industrial made swords that can go for as low as $100. Some swords command very high prices. A tachi from the Heian period will rarely go for less than $20,000. The biggest challenge will be in having a valuation of the sword. Due to the high number of replicas and forgeries in the market, many buyers will demand through assessment and valuation of your sword. 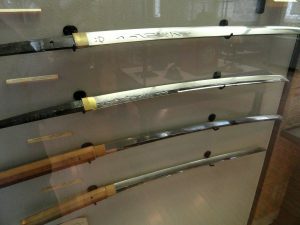 You can find experts on Japanese swords at Japanese cultural centers which are in Japanese embassies. You can also try one of the dojos teaching Japanese martial arts of especially Kendo. Some university scholars are also experts on the subject. You can negotiate price of the sword after getting through valuation. If your grandpa brought it back from japan after the war, you could be sitting on good money.